DALLAS, June 8, 2015 -- MegaFest, the nation's largest inspirational family festival, today announced Tyler Perry's new stage play, "Madea on the Run," will make a tour stop in Dallas during the five-day experience slated for August 19-23. The play will be in the arena at the Kay Bailey Hutchison Convention Center on Friday, August 21 at 7 p.m. Tickets go on sale today via Ticketmaster. "Madea always makes us all laugh while teaching valuable lessons that we remember long afterwards," Bishop T.D. Jakes said. "We are excited to welcome Tyler Perry back to MegaFest. Tyler is a friend and constant supporter of ours. We are happy to extend this platform to his fan base knowing that MegaFest attendees will enjoy this hilarious play." "Madea on the Run," which began touring in March, will be the first Tyler Perry play ever staged at MegaFest. The play's plot follows Madea, played by Perry, as she goes on the lam from local authorities and is forced to hide with her friend, Aunt Bam, played by Cassi Davis. The play's brand new score, written by Perry, promises audiences a night of laughter and inspiration. 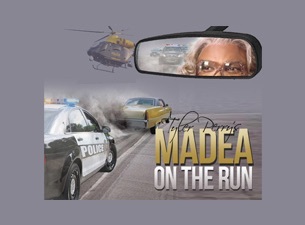 Tickets for "Madea on the Run" are available for purchase individually, separate from MegaFest ticketing packages. Additional MegaFest event and speaker updates will be announced throughout the summer, and the public is encouraged to check www.mega-fest.comfor news on speakers, schedules and other exciting announcements.